391 Marlborough is located on the north side of Marlborough, between Hereford and Massachusetts Avenue, with 389 Marlborough to the east and 393 Marlborough to the west. 391 Marlborough was designed by architect Obed F. Smith and built in 1880-1881 by Vinal & Dodge, masons, and G. & E. Stewart, carpenters, for building contractor George Wheatland, Jr., for speculative sale. It was one of six contiguous houses (381-383-385-387-389-391 Marlborough) built at the same time and one of twelve contiguous houses (369-371-373-375-377-379-381-383-385-387-389-391 Marlborough) built for George Wheatland, Jr., in 1879-1881. He is shown as the owner of 381-391 Marlborough on the original building permit application for the six houses, dated November 11, 1880 (one application for six houses). 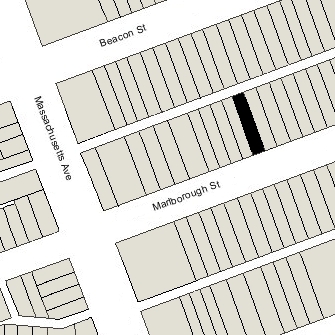 Click here for an index to the deeds for 391 Marlborough, and click here for further information on the land on the north side of Marlborough between Hereford and Massachusetts Avenue. On June 3, 1882, 391 Marlborough was purchased from George Wheatland, Sr., by real estate dealer Charles R. Evans, and on the same day he transferred the property to his father and business partner, Brice Shepherd Evans. On September 16, 1882, 391 Marlborough was purchased from Brice Evans by Martha Ada (Silsby) Howe, the wife of Lemuel Rice Howe. They previously had lived at 33 Fairfield. He was a dealer in dyewoods, analines, and extracts, and later also was a commission merchant in the Calcutta trade. On June 1, 1894, 391 Marlborough was purchased from Martha Howe by paper manufacturer Mortimer Blake Mason. He and his wife, Mary (Phillips) Mason, lived at 347 Commonwealth. 391 Marlborough became the home of Mortimer Mason’s mother, Sarah Elizabeth (Warren) Mason, the widow of John Warren Mason, and Mortimer Mason’s sister, Sarah Dean Mason. They previously had lived at 341 Marlborough. Sarah (Warren) Mason died in June of 1897 and Mortimer Mason died in February of 1909. In his will, he left 391 Marlborough to his sister. Sarah Dean Mason continued to live at 391 Marlborough until her death in June of 1931. On July 8, 1931, 391 Marlborough was purchased from Sarah Dean Mason’s estate by Mary A. (Black) Woodward, the widow of William Edward Woodward, and her sister, Miss Nora C. Black, a dressmaker. They operated it as a lodging house. They had lived in Brookline in 1930. Mary Woodward died in July of 1939, and Nora Black died in March of 1940. In 1940, Mary Woodward’s daughter, Theresa M. (Woodward) Doyle, and probably her husband, Francis Joseph Doyle, lived briefly at 391 Marlborough and operated it as a lodging house. They had moved to Brookline by 1941. In August of 1940, real estate and mortgage dealer Gerald G. E. Street foreclosed on the mortgage given by Mary Woodward and Nora Black when they purchased 391 Marlborough and took possession of the property. On October 14, 1940, 391 Marlborough was acquired from Gerald Street by Bernard (Bernardus) P. Botzen, who lived at 39 Winchester. He was associated with the Christian Science Benevolent Association in Chestnut Hill. The property was managed on his behalf by Gerald Street’s real estate firm, Street & Company, and in July of 1941 it filed for (and subsequently received) permission to convert the property from a single-family dwelling into a lodging house. By 1942, 391 Marlborough was the home of Anna Louisa Walter, the widow of William Walter, and her sister, Blanche (Austin) Wharton, the widow of George Wharton. They operated it as a lodging house. They previously had lived at 364 Marlborough. By 1943, Blanche Wharton had moved to Roxbury. Anna Walters continued to live at 391 Marlborough in 1945, but moved thereafter. On October 1, 1945, 391 Marlborough was acquired from Bernard Botzen by Frank Thomas Richardson and his wife, Elizabeth (Oswald) Richardson. He was a carpenter and toy manufacturer. In June of 1946, the Richardsons filed for (and subsequently received) permission to convert the property from a lodging house into lodging house with one apartment, indicating that they would occupy the basement and first floor, and have lodging rooms on the upper floors. They continued to live and operate a lodging house at 391 Marlborough until about 1948. On February 20, 1948, the Richardsons transferred 391 Marlborough to his mother, Alice Grace (Kidd) Richardson Carver, the former wife of Frank Danforth Richardson and the wife of Harry Percival Carver. The Carvers lived in New York City. On June 15, 1948, Alice Carver transferred the property back to Elizabeth Richardson. On November 26, 1948, 391 Marlborough was acquired from Elizabeth Richardson by Jacob Leroy Garber, a postal clerk and realtor, and his wife, Edith (Edythe) Ila (Chasens) Garber. 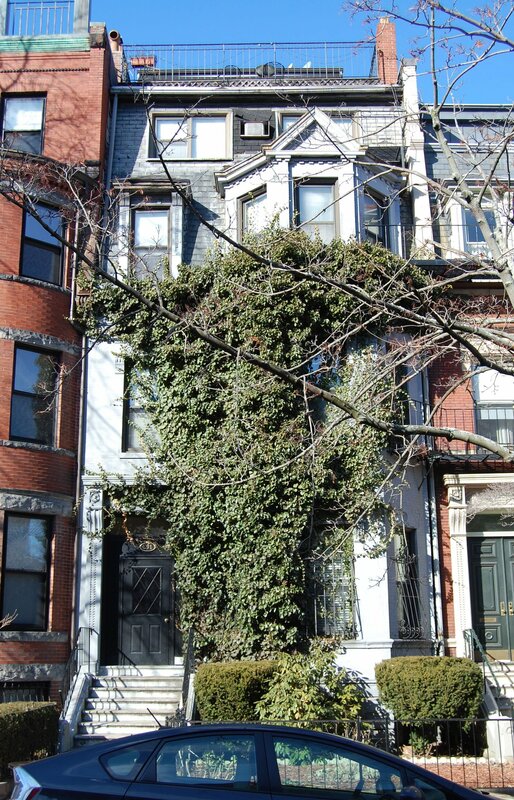 They lived in Brookline, where they had moved in about 1947, having previously lived at 350 Marlborough. In November of 1948, he applied for (and subsequently received) permission to convert 391 Marlborough from a lodging house with one apartment into eight apartments. It was probably at this point that a penthouse was added. On February 29, 1952, the Garbers transferred the property into his name as trustee of the Byron Hall Trust. On June 30, 1960, 391 Marlborough was acquired from J. Leroy Garber by real estate dealer and contractor Michael J. Smith. On July 18, 1960, he transferred the property to his company, Michael J. Smith, Inc.
On March 1, 1961, 391 Marlborough was acquired from Michael J. Smith, Inc., by Robert White, and on August 5, 1969, it was acquired from him by Keith John Cooper-Baines and Mac Clanning Grant. On August 5, 1969, Robert White foreclosed a mortgage given by Keith John Cooper-Baines and Mac Clanning Grant and took possession of the property. In December of 1988, he filed for (and subsequently received) permission to reduce the number of apartments from eight to seven. On March 18, 1991, Robert White transferred 391 Marlborough to Charles White Management, Inc.
391 Marlborough remained an apartment house in 2017.